Figure 1: NVIDIA Jetson TX2 Developer Kit. 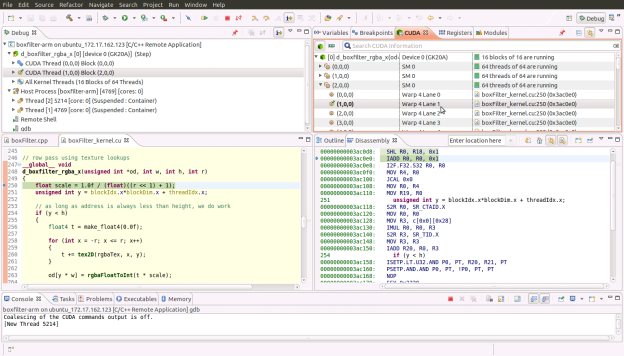 NVIDIA Nsight Eclipse Edition is a full-featured, integrated development environment that lets you easily develop CUDA applications for either your local (x86) system or a remote (x86 or ARM) target. 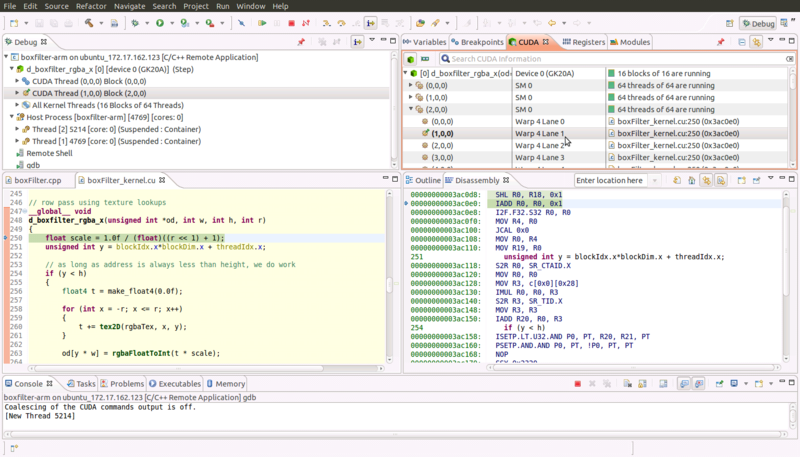 In this post, I will walk you through the process of remote-developing CUDA applications for the NVIDIA Jetson TX2, an ARM-based development kit. Note that this how-to also applies to Jetson TX1 and Jetson TK1 (this post is an update to an older post aimed at Jetson TK1). Nsight Eclipse Edition supports two remote development modes: cross-compilation and “synchronize projects” mode. Cross-compiling for ARM on your x86 host system requires that all of the ARM libraries with which you will link your application be present on your host system. In synchronize-projects mode, on the other hand, your source code is synchronized between host and target systems and compiled and linked directly on the remote target, which has the advantage that all your libraries get resolved on the target system and need not be present on the host. Neither of these remote development modes requires an NVIDIA GPU to be present in your host system. 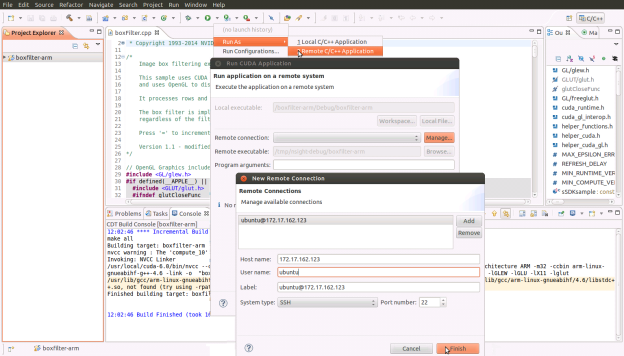 Note: CUDA cross-compilation tools for ARM are available in the Ubuntu installer packages of the CUDA Toolkit. If your host system is running a Linux distribution other than Ubuntu, I recommend the synchronize-projects remote development mode. The first step involved in cross-compilation is installing the CUDA Toolkit on your host system. You need to install the CUDA 8.0 Toolkit for Jetson TX2 or TX1, or the 6.5 Toolkit for Jetson TK1. You can download the CUDA Toolkit installer for Ubuntu from the CUDA Downloads page, or using Jetpack L4T. I recommend that you use use Jetpack L4T to install the same version of the CUDA toolkit for both the host and target systems. Once the toolkits are installed on both host and target, download the required Ubuntu DEB package from the CUDA download page to do the cross-platform setup. You can find installation instructions in the CUDA Installation Guide. I will summarize them below. First let’s get your host system set up for cross-platform CUDA development. The following target architectures are supported for cross compilation. 1. Enable the foreign architecture. The foreign architecture must be enabled to install the cross-platform toolkit. To enable armhf, arm64 (aarch64), or ppc64le as a foreign architecture, execute the following commands. 3. Install cuda cross-platform packages. On supported platforms, the cuda-cross-armhf, cuda-cross-aarch64, and cuda-cross-ppc64el packages install all the packages required for cross-platform development to ARMv7, ARMv8, and POWER8, respectively. The libraries and header files of the target architecture’s display driver package are also installed to enable the cross compilation of driver applications. At the end of these steps you should see aarch64-linux or armv7-linux-gnueabihf and the optional x86_64_linux folder under /usr/local/cuda-8.0/targets/. 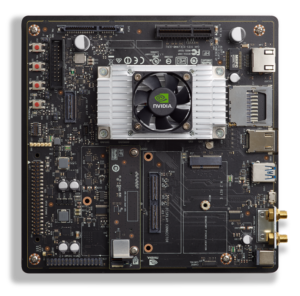 For your cross-development needs, Jetson comes prepopulated with Linux for Tegra (L4T), a modified Ubuntu Linux distribution provided by NVIDIA. NVIDIA provides the board support package and a software stack that includes the CUDA Toolkit and OpenGL drivers. You can download all of these, as well as examples and documentation, from the JetPack page. With the CUDA Toolkit installed and the paths setup on the host system, launch Nsight by typing “nsight” (without the quotes) at the command line or by finding the Nsight icon in the Ubuntu dashboard. Once Nsight is loaded, navigate to “File->New->CUDA C/C++ Project” and import an existing CUDA sample to start the Project Creation wizard. For the project name, enter “boxfilter-arm” and select “Import CUDA Sample” in the project type and and select the supported “CUDA Toolkit” in the toolchain. Next, choose the Boxfilter sample which can be found under the Imaging category. Figure 2: Selecting Target CPU Architecture in NSight Eclipse Edition. The remaining options in the wizard let you choose which GPU and CPU architectures to generate code for. First, choose the GPU code that should be generated by the nvcc compiler. For Jetson TK1 (NVIDIA Kepler GPU), choose 3.x GPU code and 3.x PTX code. For Jetson TX1 (NVIDIA Maxwell GPU), choose 5.x GPU code and 5.x PTX code. For Jetson TX2 (NVIDIA Pascal GPU), choose 6.x GPU code and 6.x PTX code. The next page in the wizard lets you decide if you wish to do native x86 development or cross-compile for an ARM system. Choose “AArch64” for Jetson TX1/TX2 and “ARM” architecture for TK1 in the CPU architecture drop-down box. CUDA samples can be imported and run on various hardware configurations. 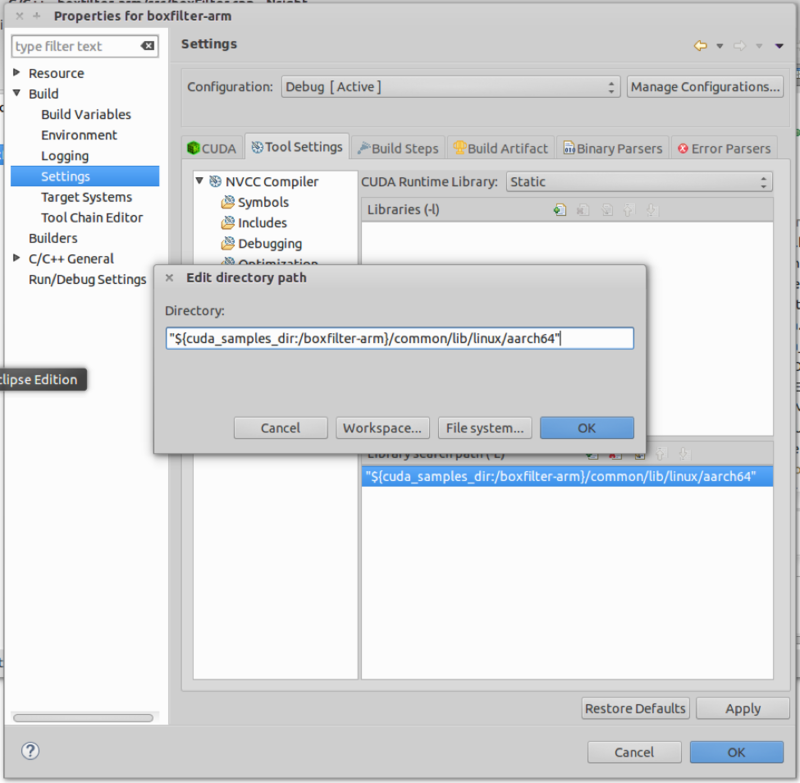 For this cross-build exercise you need to resolve the ARM library dependencies used by this application. Here’s how. Right click on the project and navigate to Properties->Build->Settings->Tool Settings->NVCC Linker->Libraries and edit and enter the “Library search path(-L)” to point to linux/aarch64 (for TX1/TX2) or linux/armv7l (for TK1) instead of linux/x86_64. This will resolve the libGLEW library dependencies. Also remove the entry for GLU if present since that library is unused (only for Nsight v6.5). Click on the Miscellaneous tab and add a new -Xlinker option —unresolved-symbols=ignore-in-shared-libs. Also select the option “Link with OpenGL libraries” if present. In the terminal window use the scp utility to copy the remaining libraries. After the compilation steps, the linker resolves all library references, giving you a ready-to-run boxfilter-arm binary. To run the code on the target Jetson system, click on Run As->Remote C/C++ Application to setup the target system user and host address. Once you finish the remote target system configuration setup, click on the Run icon and you will see a new entry to run the boxfilter-arm binary on the Jetson. Note: the box filter application relies on data files that reside in the data/ subfolder of the application, which you will need to copy to the target system. Use the scp utility to copy those files into the /tmp/nsight-debug/data/ folder on your Jetson. To ensure that the application runs on the correct display device, add this line to the top of the main function if not already there. This is not required on CUDA toolkit 8.0 samples. 3. Also comment out the call to freeTextures() in the cleanup() function since it might cause runtime error. Click on Run to execute the modified Box Filter application on your Jetson. Before you launch the debugger, note that by default Jetson doesn’t allow any application to solely occupy the GPU 100% of the time. In order to run the debugger on Jetson TK1, you need to fix this using the following command (note: this is not required on Jetson TX1/TX2). Now you can launch the debugger using the debug icon back on the host system. Nsight will switch to its debugger perspective and break on the first instruction in the CPU code. You can single-step a bit there to see the execution on the CPU and watch the variables and registers as they are updated. To break on any CUDA kernel executing on the GPU, , go to the CUDA view in the top-right pane of Nsight and click on the cube icon dropdown. 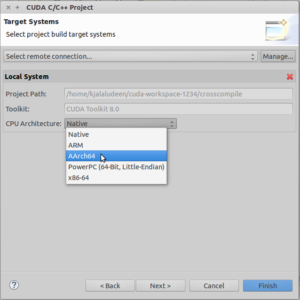 Then select the “break on application kernel launches” feature to break on the first instruction of a CUDA kernel launch. You can now resume the application, which will run until the first breakpoint is hit in the CUDA kernel. From here, you can browse the CPU and GPU call stack in the top-left pane. You can also view the variables, registers and HW state in the top-right pane. 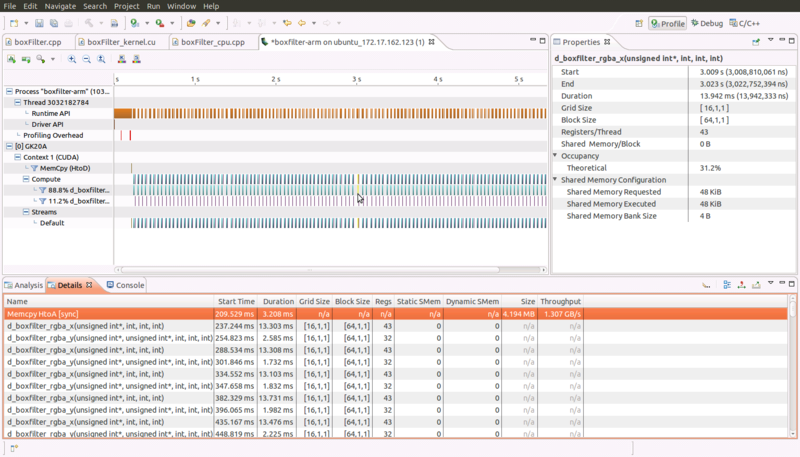 In addition, you can see that the Jetson GPU is executing 16 blocks of 64 threads each running on its Streaming Multiprocessors (SMs). You can also switch to disassembly view and watch the register values being updated by clicking on the i-> icon in the debug view to do GPU instruction-level single-stepping. Switch back to the C++ project editor view to start the profiler run. The remote target system configuration you set up in Nsight earlier will also be visible to you under the profiler icon in the toolbar. You can also get a source-to-instruction correlation view, with hot spots (where the instructions-executed count was particularly high) identified in red as the figure below shows. 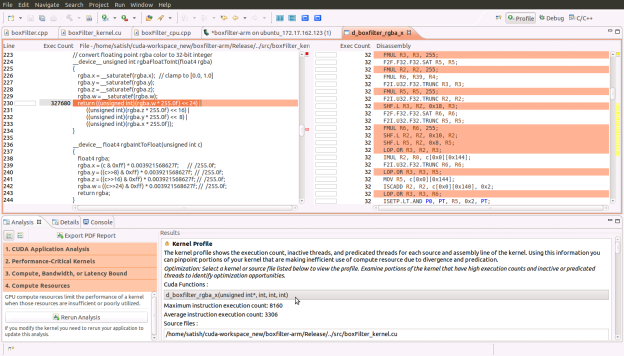 You get this view from within the guided analysis mode by first clicking on “Examine Individual Kernels” and selecting the highest ranked (100) kernel from the list of examined kernels, then clicking “Perform Kernel Analysis” followed by “Perform Compute Analysis.” From there, clicking “Show Kernel Profile” shows the d_boxfilter_rgba_a kernel in the right pane. Double-click on the kernel name to see the source-to-instruction view. Clicking on a given line of source code highlights the corresponding GPU instructions. As you can see, whether you are new to NVIDIA Nsight Eclipse Edition or an avid Nsight user, Nsight makes it just as easy and straightforward to create CUDA applications for the Jetson TK1 platform as for all your CUDA-enabled GPUs. Start by downloading the CUDA Toolkit. If you are new to CUDA, check out this tutorial to get you started with CUDA programming. To learn more about Jetson TX2, NVIDIA’s latest embedded developer platform, read “NVIDIA Jetson TX2 Delivers Twice the Intelligence to the Edge“. Kudbudeen Jalaludeen is a senior software engineer at NVIDIA currently working on CUDA developer tools. He has a Bachelor's degree in Electronics and Communication Engineering and experience developing tools and IDEs based on eclipse and other UI frameworks.